Twenty-two years after making a debut in Miami, Venus Williams is still capable of delivering some good wins, beating a qualifier Dalila Jakupovic 7-5, 6-3 in an hour and 18 minutes for the place in the second round. The veteran lost serve four times and did enough on the return to overcome that deficit and win more than half of the return points, creating 12 chances and scoring six breaks for straight sets win. Dalila opened a 4-2 lead with a double break, allowing Venus to level the score at 4-4 before breaking her again in game nine to serve for the set. Instead of bringing the opener home, Jakupovic lost 12 of the last 15 points, with Venus securing breaks in games ten and 12 to steal the set 7-5. The American controlled the pace in set number two, racing into a 5-1 lead and sealing the deal with a hold in game nine for the place in the second round. Alison Riske ousted a qualifier Kaia Kanepi 6-2, 6-2 in 80 minutes, fending off six out of seven break points and dominating on the return to grab five breaks and march towards the finish line. The 15-year-old Cori Gauff clinched the maiden WTA win after a thrilling 3-6, 6-3, 6-4 victory over another youngster Catherine McNally in two hours and 23 minutes. After some interesting junior clashes, Cori and Catherine had the opportunity to play on the WTA level for the first time and they gave their best to emerge at the top, with Gauff taking just three points more overall. Playing against 14 break points, Cori repelled nine of those and she found the way to notch six breaks and overcome the deciding set deficit and reach another milestone as the first player born in 2004 with the WTA triumph. The older and better-ranked player gained the opening set with a double break before losing ground completely, sending Gauff 5-0 up in the second set and making the decider inevitable after Cori saved a break point in game nine. Catherine rattled off three straight breaks in set number three, forging a 4-2 advantage and wasting game points that could have pushed her closer to the finish line. 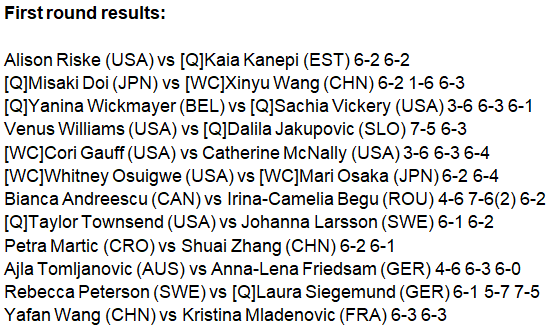 Instead of that, the persistent Gauff broke back and secured 15 of the last 18 points to book the place in round two and show her amazing physical and mental strength once again. Indian Wells champion Bianca Andreescu was on the verge of defeat too, bouncing back from a 6-4, 5-1 deficit and saving a match point to dismiss Irina-Camelia Begu 4-6, 7-6, 6-2 in two hours and 33 minutes. The world no. 24 suffered five breaks and had to dig deep to erase that deficit, keeping faith in herself and never looking back after that challenging second set that almost sent her out. Begu broke the Canadian twice in the opening set for a 6-4 and she was just a step away from the finish line, adding three straight breaks to her tally in set number two, having a match point on serve at 5-2. Carried by the momentum she assembled at Indian Wells, Bianca fended it off, serving well in the rest of the set and pulling another break back at 4-5 to set up a tie break that she won 7-2. With the physical strength on her side, a teenager did everything right in the final set, sailing through her service games and breaking Begu in games one and seven for the place in the second round.